One meal that stays constant throughout the year — by popular demand —Is Pennswood’s “signature” Sunday meal. Chef Steve says that the Sunday menu features “more of a brunch feel.” Classics like eggs benedict accompany unique specialties such as a sour cream pancake with pecan butter. Many of the vegetables that Chef Steve and his team use in the kitchen at Pennswood come from “right down the block” in the well-known community garden. For example, the culinary crew at Pennswood used a lot of tomatoes, zucchini, squash and herbs from the community garden in the dishes they made this summer. Although some of the ingredients come from just a walking distance away, a lot of the other ingredients that Pennswood uses are also locally or regionally sourced. Pennswood is proud to be a community of individuals, and celebrating our residents extends to the dining room as well. 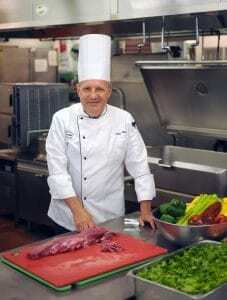 Residents freely send their recipes and recipe ideas to Chef Steve and his team, and they frequently take these suggestions and turn them into meals that serve the entire dining room – about 150 people. Chef Steve also noted that Pennswood residents give their feedback on the food daily, and the dining services team members take the time to implement residents’ comments into the work they do. With 44 years in the industry, constant feedback helps keep Chef Steve on his toes. To experience the delicious tradition of fine dining at Pennswood Village, we would be happy to host you for a meal at our welcoming community. Simply click here, or call 215-504-1118 to schedule your visit!